Lamb meatballs at FGK in Byram. Officially, the Famous Greek Kitchen is in Greenwich, but geographically it is situated in Byram, a suburb of a suburb. Byram is not a high-profile town like Greenwich, and I knew little about it. Cruising in my car on my way to Byram I felt like I was in a new exotic place. It didn’t feel like Connecticut, nor did it feel like anyplace over the New York line. It was an interesting hybrid worth a deeper look. I took a table at FGK. These initials are on the awning outside and stand for Famous Greek Kitchen. FGK might be best known for their Greek pizza, many still order it and it is delivered locally, but this is not a “pizza place.” The menu is much more sophisticated and broader then just pizza and that is why I am here today. As many of us know, Connecticut is THE pizza state. Sorry, Rhode Island and Massachusetts, but it is us, not you. The pizzas we are famous for are the thin crust Neapolitan ones as served at the iconic Pepe’s, Sally’s or Modern. One could refer to them as “New Haven-style pizza” which also defines them accurately. Indulge your fast-food craving with a healthier gyro that captures the spirit of the traditional meaty street cart meal. Tempeh’s firm texture and boundless flavor adaptability makes it an excellent stand-in for lamb meat. Greek Pizza is not linked to any particular town or city in Connecticut. It is rather easy to find and is always specified as Greek pizza not just pizza or apizza like the Italian thin crust beauties. It is thicker and yeastier with less of a tomato tang to it, and it is often ordered plain, which in my opinion is still the best way to appreciate it. No clam would dare sully a Greek pizza. The simple dish is not depended on virtuoso toppings or a well-charred semolina coated bottom. It is a homey deep-dish delight. If Greek pizza is new to you, FGK is a good place to try one. It was a lovely warm day so I chose to sit outside on the covered patio. It was delightful, comfortable, pretty with verdant greenery. Best of all, the wait staff were always around. I have a dread of patio dining where you sit outside at your table and pray that a server might someday emerge from inside the restaurant. You feel like you are annexed in a parking lot far from the actual restaurant, isolated and alone where your growling stomach will not be heard and your feeble arm waves not noticed. The appetizers on the FGK menu caught my eye. I love to try many different things and ordering multiple small plate appetizers is one good way to do this. Baked Warm Honeyed Feta immediately grabbed my attention and I am glad it did because it turned out to be a showstopper. Feta and gorgonzola cheeses are melted with plump whole dates, thyme and honey. You spoon this on to a crescent of fresh pita. It is an absolutely fabulous combination. A riff on this is the Baked Shrimp Saganaki; saganaki is the white Greek cheese often served flambéed. Here it is layered with feta, tomatoes, shrimp and fresh herbs. 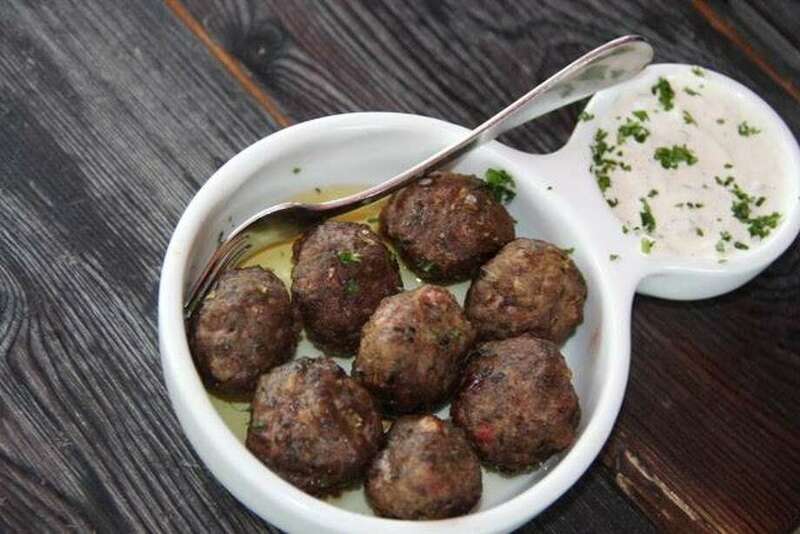 Keftedes are small marble-sized lamb meatballs, sided with a mint yogurt dipping sauce. I liked them but not as much as the spiced lamb sausage with sweet onions and cheese. Looking around me, I was struck by the way the customers were dressed. It was almost comedic how the clusters of ladies at lunch all wore identical white capris, carried Louis Vuitton handbags, were impeccably manicured and coiffed with sun-streaked blonde hair. I would call this a Greenwich look, but at FGK there were regular folks, who looked like they shopped at Kohls and polished their own fingernails. No matter how they were turned out everyone looked clean and happy and everyone seemed deeply satisfied with the food set before them. The ladies who lunched all ordered salads. Fortunately, these were not the skimpy salads of women who pushed a piece of lettuce around their plate with a fork. The salads came served in a deep white china bowl and were hearty and original. I ordered “Five Shades of Green,” a novel mix of cucumbers, sliced avocados, Granny Smith apples, pistachios and golden raisins. I added grilled chicken, which made the salad such a whopping portion I took some of it home. Since I mentioned chicken I do have one question for the management. At the bottom of the menu it states “all chicken used is caged, hormone and antibiotic free.” I get the last two brags but isn’t free-range chicken more humane and desirable? Leaving any chicken controversy behind let me point you to the gyros which are fantastic. My favorite one was the traditional lamb and beef combo, shaved thin from the rotisserie, slathered with herbs and yogurt sauce on a very fresh pita bread. Delish. Just as it is possible to make a hearty meal from the great appetizer selection, you can do the same with the list of side dishes. I started with the classic Greek Avgolemono soup (a lemon-based chicken and rice broth) and alongside the potato “frites” that had been blasted with hellish Sriacha and served “buffalo wing style” with a blue cheese dip. Don’t overlook the Horta, an exotic item you will seldom see on restaurant menus. Horta are steamed dandelion greens sautéed with olive oil and lemon: very unusual outside the Greek Isles. It is hard to go wrong at FGK. If you feel like a newbie at Greek cuisine, let me make it simple for you. Order anything that has any of the following: lamb, lemon, cheese, pita, yogurt, shrimp, pizza, mint, dates, honey. I promise you that you will have chosen wisely. Enjoy the patio or the rather fancy-schmancy interior dining room with the tall tufted white leatherette booths. If you want to dine with one foot in high-end dining and one foot in ethnic comfort food, you will love FGK.